Northamptonshire and Glamorgan played out a leisurely draw on the final day of their LV= County Championship Division Two match at Wantage Road, after the weather had scuppered any chance of a positive result. After fewer than 85 overs were possible in the opening three days, morning discussions were held between captains Alex Wakely and Graham Wagg, the latter standing in for the injured Mark Wallace, but no agreement on a contrived finished could be reached. Instead the match petered out into a draw with both sides going through the motions for much of the day, Northants taking their overnight 128-5 onto 278, with half centuries for Adam Rossington and David Murphy, before Glamorgan reached 99-3 when the teams shook hands. The draw means Northamptonshire take ten points to Glamorgan’s nine, but with Essex beating Leicestershire, a third place finish looks beyond both sides heading into the final round of fixtures. Overnight rain caused a 30 minute delay to proceedings, but once play got underway Rossington doubled his overnight 25 to move to a seventh half century of the season, scoring at a run a ball before chipping Dewi Penrhyn Jones to mid-off on 59, Penrhyn Jones finishing with 3-55 on debut. Rory Kleinveldt also fell before lunch, bowled by Michael Hogan for 7, but either side of the interval Murphy completed a composed unbeaten 58, in what could be his last innings at Wantage Road with the wicket keeper out of contract and unlikely to be offered a fresh deal. He enjoyed support from Olly Stone and Mohammed Azharullah, who both made 20 in stands of 37 and 29 for the eighth and ninth wicket respectively, before Wagg, deputising after Wallace injured his calf batting on the second day, removed Azharullah and last man Richard Gleeson to claim 4-77. With Wallace also unable to bat second time around, Andrew Salter joined James Kettleborough in opening the batting, but could make just four before edging Azharullah to first slip. However there was some concern for Northants as Olly Stone pulled up after bowling only seven balls, limping off holding his side just a day after being named in the England Performance Program squad. Richard Gleeson was making his Championship debut for Northants, having also played against the Australians, and took his first two wickets either side of tea, Kettleborough caught behind and Colin Ingram LBW, both having made 14. The latter would prove be the last meaningful action of any note before the teams shook hands shortly after 4:20, Adam Rossington sending down the final over, his first in professional cricket, six deliveries of tame medium pace that summed up the day’s proceedings. 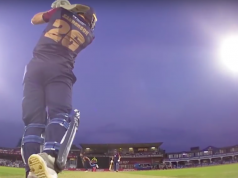 Northants head coach David Ripley was left to reflect on a frustrating week, but after discussions about any possible declarations broke down, he was content to play out the game for bonus points. “The weather’s played a bit part in this game, bad light, wet outfield, quite a frustrating four days,” he said. “We were confident, it was a key game as we were on the same amount of points as Glamorgan and it was a game we were looking to win and unfortunately the weather’s beaten both teams. Graham Wagg took over captaincy duties after Mark Wallace’s injury and praised his fellow players for their commitment levels during the weather affected week. 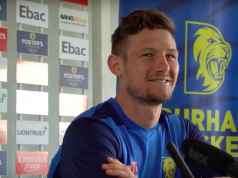 “It was a frustrating four days cricket, there was a couple of injuries and it’s not an easy game to get yourself up for, but we did and we tried our best but unfortunately the weather ruled out any possibility of a result. “A draw was potentially always on the cards, there was talks of a game, they were interested then they wasn’t interested and it kept going backwards and forwards.